Pocket ESA has been designed to minimize the amount of time required to generate a Phase I ESA report while maximizing user flexibility when generating the final report. The program is used to collect answers to pre-designed questions. These answers are then merged with a report template and a standard report is generated for the Phase I ESA. The merging process allows the user to insert different responses and paragraphs into the report depending upon how a question is answered. Data collection can be performed either with a Pocket PC or laptop. Step one is to create a report template using Microsoft Word. This template is later merged with the specific responses of a Phase I ESA to create the final report. The template is a generic version of the final report and contains keywords where the specific answers to the questionnaire are to be merged into the report. These keywords are highlighted in the report template using a unique style created for the Pocket ESA program. The answers to be merged into the report are not necessarily the direct answers to the questions, but are the text responses associated with the answer. Step two involves creating a questionnaire used to collect the Phase I ESA data. Afterwards, the questionnaire can be downloaded to the Pocket PC or used directly on the desktop. Questionnaires are divided into sections and subsections which can contain any number of questions. For every question a question type is selected. The question type determines the format of the question and allowable answers that are used to collect the data. There are numerous question types that can be selected. After the question type has been selected and the question entered, the text associated with each allowable response is entered. This is the text that will actually be merged into the final report. Using the questionnaire created in step 2, the user can now used to collect the Phase I ESA data in the field. The data for a Phase I ESA is collected by answering each of the questions in the questionnaire. The form type and allowable answers for each question are specified when the questionnaire is created. Data is saved automatically as it is entered. The final step is to create a final report by merging the data collected on the Pocket PC or desktop with the report template. During the merging process the keywords in the report template are replaced by the text associated with each of the answers to the questions. After the Phase I ESA data has been merged a final report will be created in Microsoft Word format. This report can then be edited in Word. Pocket ESA is based upon the project concept for data storage, wherein the user has a number of projects, each containing a number of Phase I ESAs. Using this method, a Microsoft Access database is used to store each project. Individual projects are stored in a separate directory, which can either reside on a single computer or spread across a network. A master database is used to keep track of projects and their locations. This database also stores data (such as questionnaires and text macros) common to all projects. Separate toolbar for project functions only. New projects can be easily created. Project directories are automatically created. Existing projects can be opened and closed using toolbar and menu commands. Projects can be deleted, including project directories. Projects not in master database can be imported into master database. Projects can be exported to be used on a different computer. Phase I ESAs can be uploaded from the Pocket PC one at a time or an entire project at a time. For example, if the answer to the question “Are there any ACMs suspected?” is “No” the text merged into the final report is not necessarily “No” but could be a paragraph of text that has been associated with this response; such as, “There are no asbestos containing materials suspected on the subject property.” This response can be further edited on the desktop prior to being merged. Templates are created and edited in Microsoft Word. Each questionnaire has one report template. Report templates can be used by more than one questionnaire. Report templates can be created from an existing report. Unlimited number of keywords in a report template. Keywords can be replaced only once or throughout the report. The Phase I ESA style can be customized in preferences. An appendix can be added to the report template that will only contain the questions and their direct answers. After the report template has been created the next step is to create a questionnaire that is used to collect the Phase I ESA data. This questionnaire will assign a keyword specified in the report template to each question. The text associated with the answer to that question will then replace the keyword when the actual Phase I ESA data is merged to create a final report. For every question a question type is selected. The question type determines the format of the question and allowable answers that are used to collect the data. 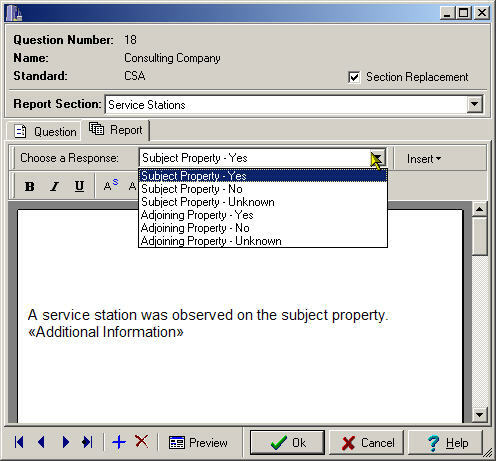 After the question type has been selected and the question entered, the text associated with each allowable response is entered. This is the text that will actually be merged into the final report. Questionnaires stored in a Microsoft Access database. Unlimited number of sections and subsections. Each question has a question type assigned that determines the types of allowable responses. There are several questions types. Questionnaires can be downloaded to the Pocket PC or used directly on the desktop. Questionnaires can be imported and exported for use on other computers. After a questionnaire has been created, Phase I ESA data can be collected on either the desktop or Pocket PC. All Phase I ESA data is organized into Projects. Before the data for a Phase I ESA can be entered, either a new project must be created or an existing project opened. The created or opened project is then referred to as the current project. After the project has been opened, the new Phase I ESA can be created. Projects can contain an unlimited number of Phase I ESAs. All Phase I ESAs are stored in the project database in Microsoft Access database format on the desktop and binary format on the Pocket PC. Phase I ESA data can be entered on the Pocket PC or desktop..
Data entered on the Pocket PC can be uploaded and edited on the desktop. 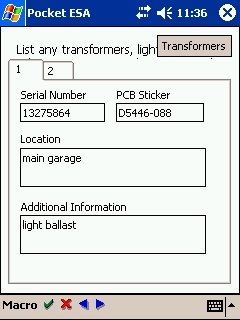 Phase I ESA data is saved automatically as it is entered on the Pocket PC. 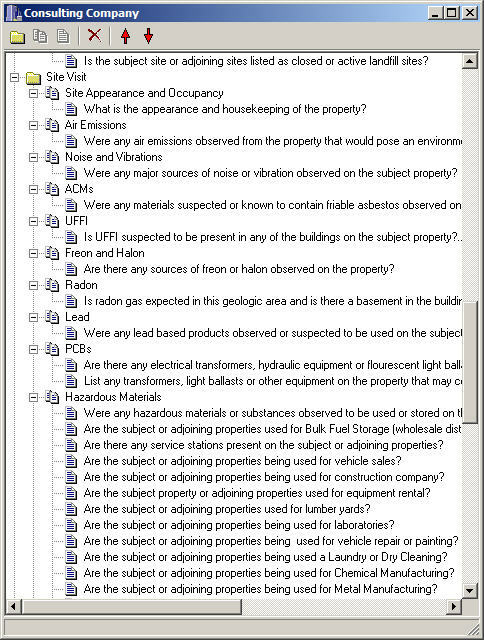 Text macros can be created on the desktop and used on the Pocket PC to rapidly enter common text answers; such as, asbestos materials, drainage, site descriptions, storage tank contents, etc..
After the Phase I ESA data has been collected on the Pocket PC or desktop, it can be merged with the report template to create the final report. During the merging process keywords in the report template are replaced by text associated with each answer to Phase I ESA questions. This last step in the process is performed on the desktop version of the program. When the merging is complete a final report will be created in Microsoft Word format. This report can then be edited in Word to include the information regarding the records reviews and interviews. One or all of the Phase I ESAs in a project can be merged. 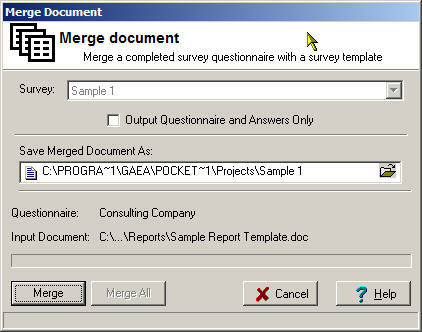 There is an option to merge only the questions and answers without the report template. This can be used to create an appendix of the Phase I results. Pocket ESA has been designed to run on a variety of pocket computers. Below are the software and hardware requirements for the program.